Need some fresh air? Here’s 14 of the best patios and rooftop bars in Durham. It took a while, but patio season has finally landed in Durham. Here’s where you’ll find us eating and drinking outside. They have a gorgeous bamboo garden topped off with a water fountain and koi pond, tons of outdoor seating that is pet and kid friendly. Now for the food. We can’t rave enough about their Korean eats. We 100% recommend the the Bo fries and spicy pork mandoo. Dogs are also allow inside their beer hall. Guglhupf is pure magic. Their German-style bakery, serves up breads, pastries, and desserts, they’re an award-winning local favorite. You can also grab brunch, lunch, and dinner at their cafe and biergarten that features cuisine with southern German roots, emphasizing local and seasonal ingredients. They do all of them to perfection. We love their outdoor seating that’s accompanied by a water foundation and tons of greenery. Cafe + Bakery: Free 12oz drip coffee with a $15 purchase. Valid Tues – Fri, Bakery + Cafe hours only. Biergarten: Free single Brotzeit w/ purchase of 2 Small Plates or 1 Large Plate. Valid Tues – Thurs. This renovated former gas station, Geer Street Garden, has an awesome patio for grabbing lunch or soaking up the warm weather with a beer. There’s plenty of picnic tables with a mostly shaded area and fans. You can’t go wrong with the all you can eat Sunday brunch and build your own bloody mary bar. A prime spot during baseball season, this patio overlooks the Durham Bulls Athletic Park. So you can catch a game or the fireworks on Friday nights during home games. They serve updated American pub grub. If you’re into sports, this is the spot for you- they’ve got TVs galore. Named a “Next Level Brewery” by Food & Wine, you’d be hard pressed to find a beer you don’t like at Ponysaurus. Their outdoor area is dog and kiddo friendly so it’s a great spot to bring the family. They don’t serve full meals but they have a great selection of bar snacks and you can usually find a food truck or two parked outside. OR you can bring your own food and fire it up on the grill. The overall ambiance of Gonza is amazing. Tucked beside West Village Apartments, you get the feel of those historic Brightleaf buildings, plus the string lights and food. It’s all on point. Life would be much duller without Parker & Otis. I always find something so very ‘Durham’ here and a greeting card that makes me laugh out loud. This is the perfect place for an afternoon pick-me-up. They have a beautiful, large, shaded outdoor seating area. You’re not a Durhamite until you get a photo from the rooftop of the Durham Hotel, am I right? This mid-century modern hotel in the heart of downtown isn’t just somewhere for out of town guests to stay, it’s also frequented by locals for the coffee bar, restaurant, and rooftop bar. 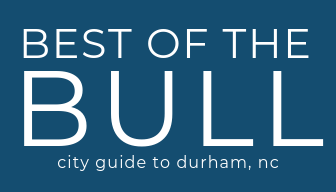 Get some of the best views of Durham and some of the best cocktails. You can even catch a yoga class up here! Unscripted is the perfect place to soak in the sunset. The former Jack Tar Motor Lodge has a spacious rooftop patio with a pool. You feel like you’re on vacation when you can sit poolside with a cocktail in hand! Parts and Labor serves food truck-like fare that you can eat in their garage bar or at the picnic tables on their patio. We love their small plates that are available at affordable prices. So you can get a quick afternoon snack or get several different items like german pretzels, beer battered cheese curds, and cheese burger sliders. They have large outdoor eating area, where you can sit in the sun or in the shade! Using apples from a family-owned orchard, Bull City Ciderworks crafts hard ciders in the heart of Downtown Durham. You don’t even have to wait for it to heat up to enjoy their outdoor space. They have an awesome fire pit to keep you warm & cozy. Because what’s better than hanging by the fire with some crisp cider? Foster’s is a Durham staple that is known for their scratch-made soups, salads, sandwiches, and casseroles. Be sure to check out their desserts as well. They have at least a dozen pies, cakes, or baked goods variety on any given day. They have plenty of picnic tables and outdoor seating making it the perfect spot to enjoy that piece of pie. We may have mentioned a time or two how much we love Cocoa Cinnamon. They have 3 locations and each has it’s own unique vibe. When it warms up we love coming to the Geer Street location for their patio. The inside is cozy with a mix of tables and couches, and the outdoor patio is perfect when the weather warms up. Their outdoor seating consists of plenty tables and benches, and we love that there is a shaded area as well. It’s also walking distance to Motorco, The Mothership, Fullsteam, and King’s Sandwich Shop so you can make an afternoon out of it! Love this list? Share it with your friends!